It's quite easy to calculate your golf score in a handicap match. To improve your golf game, you may need to buy new equipment, invest in some lessons with a teaching pro or simply put in more practice time. But golf does offer one quick and easy way to compete with superior players on a nearly equal basis – the handicap system. Once you’ve established a handicap through the United States Golf Association, you can compete head-to-head with the best golfers around and have a fighting chance to win. Look up your handicap for the course and tees you are playing. Most golf courses post charts that display a range of handicap indexes on one side and corresponding course handicaps on the other, or the you can plug your index into the course's handicap computer, which will calculate your handicap. Alternatively, you can look up a course's slope rating, and then plug the rating and your handicap index into the USGA’s online calculator. Write your handicap in the appropriate box on the scorecard. Total your score at the end of the round and then subtract your handicap to obtain your net score in stroke play, also known as medal play. Figure the difference between your handicap and your opponent’s in head-to-head match play. Whoever has the lower handicap plays at scratch, meaning that player receives no handicap strokes. The higher-handicapped player receives the difference between the two handicaps. For example, if a 7-handicap player competes with an 11-handicap golfer, the second player receives four handicap strokes. 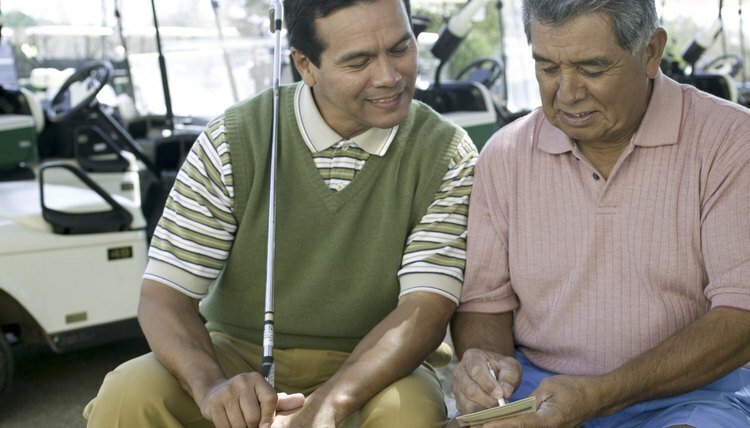 Look at your scorecard to determine where to apply your handicap strokes in match play. The scorecard displays every hole’s handicap number, which ranges 1 to 18 (hardest to easiest). Apply your handicap strokes to the appropriate holes. If you are receiving four handicap strokes from your opponent, for example, one stroke on each of the course’s four most difficult holes. If you are entitled to 24 handicap strokes, subtract two strokes on the six toughest holes and one shot on the remaining 12. Calculate the differential between the lowest handicapped player and the other three golfers in a four-person match-play event. As in a head-to-head match, the best golfer plays at scratch. The other three players receive the difference between their course handicaps and the scratch player’s course handicap. For example, if the golfers’ handicaps are 2, 3, 16 and 24, respectively, the first golfer plays at scratch, the second player receives one handicap stroke, the third receives 14 strokes and the fourth receives 22. At the end of each hole, check each player's or team's gross or net score, as is appropriate depending on the format, to determine which team wins the hole.